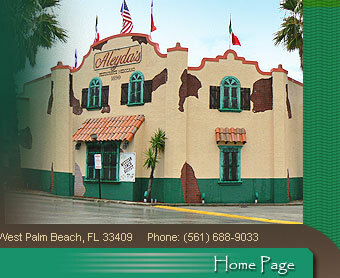 For over 30 years, South Floridians and tourists alike, have been turning to Aleyda’s for great Tex-Mex cuisine. Unlike many chain restaurants, there is a real and spirited Aleyda running the show each and every day. As the doors of her restaurant open for business, Aleyda Cardona’s eye’s sparkle with delight and she’s always ready to greet you with a smile, and an ice cold margarita and sizzling fajitas if you’d like! You’d never guess her road to the American Dream was paved with struggles and setbacks. Aleyda came to the United States in 1967. Formally trained as an executive secretary in her homeland of Colombia, she landed a job in New York City on her second day in America, despite speaking very little English. 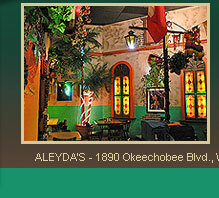 Warmer winters eventually led Aleyda to Florida in 1971. While the weather reminded her of home, Aleyda was determined to become an American and learn the English language. She learned four new words a day and landed a low paying job as a secretary. It was a start. She also began working at a friend’s restaurant to earn extra money. Aleyda’s love of cooking gave her the courage to open up her own place years later, yet the trials and tribulations of life and love forced her to take new paths and chances. Today, the one and only, a huge 150 seat, Okeechobee Boulevard location, continues to thrive in today’s competitive dining industry, thanks to her passion for food, fun, fresh ingredients and superior service. As if all that isn’t enough, one can’t help but mention the happiness you feel just sitting in Aleyda’s restaurant, brimming with sparkling lights, colorful walls, sombreros, clay pottery and artifacts that have an almost Disneyesque whimsy. You can’t help but smile. “I like making people happy. It makes it all worthwhile,” says Aleyda. Indeed it does.